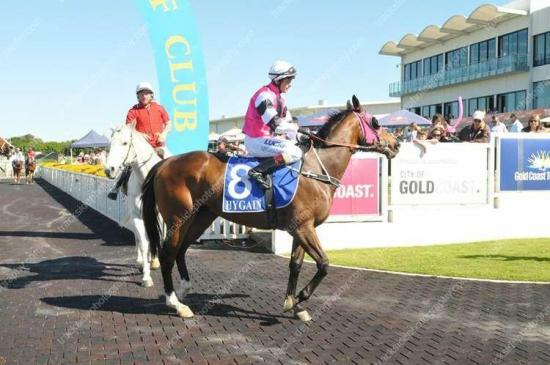 Saturday racing took Murphy Racing to the Gold Coast with Pippos. Racing in the 2200m Maiden, David elected to put blinkers on after his last strart to liven him up a bit and it seemed to do the trick. Ridden by in form jockey Nathan 'Grubby' Day Pippos jumped like his regular self missing the kick by half a length. Grubby then hunted him up to a midfield position which then saw leaders take off and were at least 10-15 lengths in front of the rest of the field. This set up the race perfectly and at the 800m Grubby took off in search for the leaders. Reeling them in rounding the turn Pippos hit the front and stayed there until around the 50m mark. He was eyeballed by the horse on the outside and Grubby lifted him off the canvas to win by half a length. Pippos will now be sent for a spell after finally breaking his maiden. Congratulations to all owners, thankyou for your patience.